Crematory's debut came 15 years ago, and since then they have established themselves as Germany's premier and legendary dark gothic metal bands. 'Pray,' their current release, dates to early 2008 in Europe. Only now is it hitting the shores of America thanks to a partnership with Blistering Records. Crematory's brand of gothic metal is dark, mysterious and foreboding. Their signature is the twin vocal attack of growling and clean vocals of Matthias and Felix. The extreme vocals are more deep than dirty or death giving the presentation an interesting contrast. Much of their music is also heavily riff-driven and plodding; don't look for many, if any, guitar solos. 'Pray' gets off to a marvelous start in 'When Darkness Falls' with a strong vocal arrangement and the only decent guitar work near the end. This is followed by the melodic and well-paced 'Left The Ground' where the deeper vocals form the chorus. After these two songs, the rest of the album drags on into repetitious and presumptuous musical monotony. It's dark, morose and lifeless like a legion of undead. 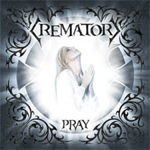 If you're into the prodding, riff-driven, sometimes symphonic, often mysterious end of gothic metal, then Crematory's 'Pray' is a must for you. However, if you like your heavy metal a little more lively, compelling and enthusiastic, you will not find it here. Instead, you will be 'praying' for relief.